Cantey Kelleher is a portrait sculptor and teacher who specializes in miniature figure portraits as well as half-to life-sized busts. She also creates two-thirds to life-sized figure portraits as garden sculptures and fountains. Typically, her original pieces are in the old-world medium of terra cotta. These finished works of art can then be foundry-cast in bronze, if desired, or cold-cast in marble. Cantey attended Hollins College and graduated from UNC-CH with a degree in psychology. She practiced in North Carolina for seven years before retiring to raise a family. 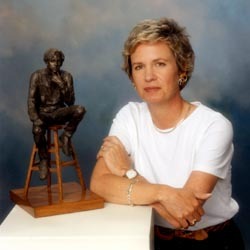 During these years she began studying portrait sculpture, receiving her first portrait commission in 1986 and her first awards - Best of Category and Best of Show - in 1990 from the North Carolina State Ceramic Association. She began teaching at Queens College and in her studio in 1995. Though the medium and style of her portraits is classic, the format is relaxed and personal in order to capture the true character and gesture of the individual. Each portrait is crafted with such life-like composition that it seems to breathe with a life of its own. " Often the casual slant of a baseball cap or the playful caress of a family pet helps capture the essence of a child or adolescent at that particular point in his or her life. The fun and challenge of three-dimensional portraiture is finding the many subtle ways to represent the spirit of the individual." Collectors along the East Coast have found that her sculptures immortalize loved ones in an art form that can be cherished for generations. Mr. & Mrs. George Watts Carr, Jr.
Mr. & Mrs. Gregory Poole, Jr.
Dr. & Mrs. R. L. Swetenburg, Jr.